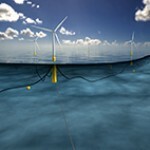 The Hywind pilot park off the coast of Peterhead, Scotland, being developed by Statoil, aims to demonstrate the feasibility of future commercial floating offshore wind farms in deepwater sites with optimal wind conditions. The site will consist of five, 6 MW floating turbines, with production of the first turbine expected in late 2017. And although a pilot project, the wind farm will be fully operational, powering around 20,000 households in Aberdeenshire. Understanding how the structures will react within this challenging offshore environment is key to establishing Hywind’s feasibility, particularly in relation to how the mooring lines will perform with the demands placed upon them. Each floating turbine will be securely moored to the seabed via MacGregor’s chain stoppers which will incorporate Strainstall’s innovative and patented strain ring monitoring sensors to provide highly accurate mooring load information.